Pauline Lowers Service Details - East Liverpool, Ohio | Dawson Funeral Home, Inc.
Chester, West Virginia – Pauline G. “Petey” Lowers, 92, formerly of California Avenue, passed away Saturday, September 29, 2018 at 12:15 am at the Orchards of East Liverpool following a lengthy illness. Born in East Liverpool, Ohio on June 2, 1926, she was a daughter of the late Dorsey Kenneth and Anna Martha Laughlin Glass. Raised in Hookstown, she graduated from the former Midland High School in 1944. Petey then graduated from the Allegheny General Nursing School in 1947. She worked at the John D. Rockefeller Vocational Tech School until her retirement. Through the years, she had also worked at Dr. Gerace’s office and had been associated with MetLife at one time. She was a member of the Westminster Presbyterian Church, the Arts Club and was active in the formation of the Chester Library where she helped organize the last dance at Rock Springs Park as a fundraiser. Her husband, Paul R. Lowers, survives. The couple married April 14, 1981. She also leaves behind a daughter, Jocelyn Wilson and her husband, David, of Freeport, Florida, as well as three grandchildren: seven great-grandchildren and six great-great-grandchildren. In addition to her parents, she was preceded in death by a son, J. Randall Figley, a sister, DJ Mansfield, and a brother, Donald Glass. Friends may visit Wednesday evening at the Dawson Funeral Home where the family will be present from 4 to 8 p.m. The Reverend Katrina Lewis of the Westminster Presbyterian Church will conduct a funeral service at 11:00 a.m. Thursday at the funeral home. 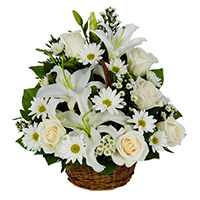 To send flowers to the family of Pauline Glass "Petey" Lowers (Glass), please visit our Heartfelt Sympathies Store.